I’ve had the strongest urge to start a new project for the past few days and I’ve kept stuffing it back down saying, “When I get done with this project…”. Well, that project had to go take an emergency bath and I allowed myself to cast-on a new project. 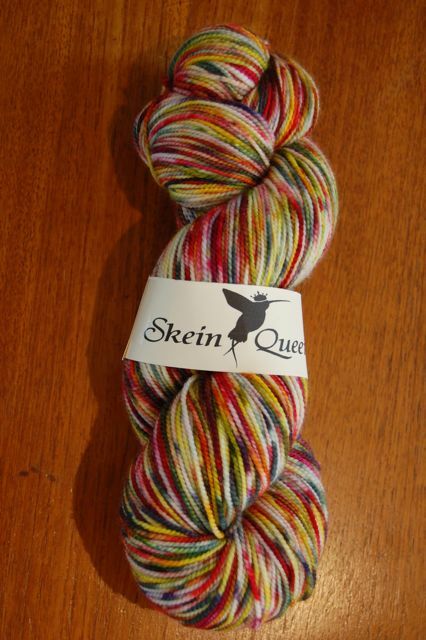 I’ve really wanted to do something with the skein of yarn that I got from the Knit Sock Club first shipment which was dyed by Skein Queen if you don’t remember. However, I really didn’t want to do socks with it. I have come to this realization that I A.) Love sock yarn, B.) Don’t really like making socks that much and C.) Really enjoy looking at sock construction. Funny huh, at least 2 of the 3 needed ingredients are there but that middle one is sort-of a doozie to get over. I mean, I love (and I mean passionately love) making tubes. If I could reasonably make tube socks, I’d be a happy camper. 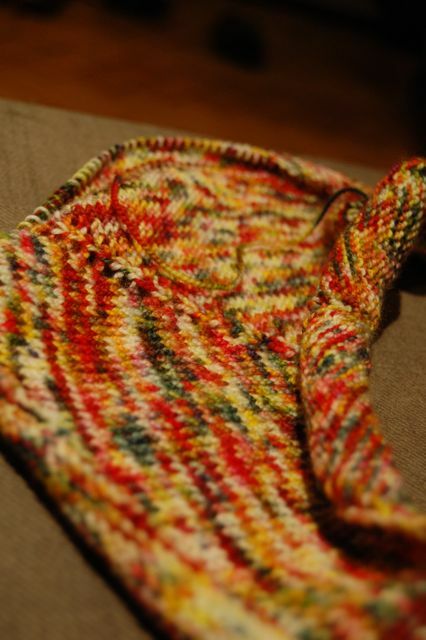 But it’s the turning the heel and toe shaping that make me put down the socks. It’s not that I can’t do them. I can! I’ve completed 2 pairs of socks at this time with little or no help from others. It’s just that at that point I always put them down. 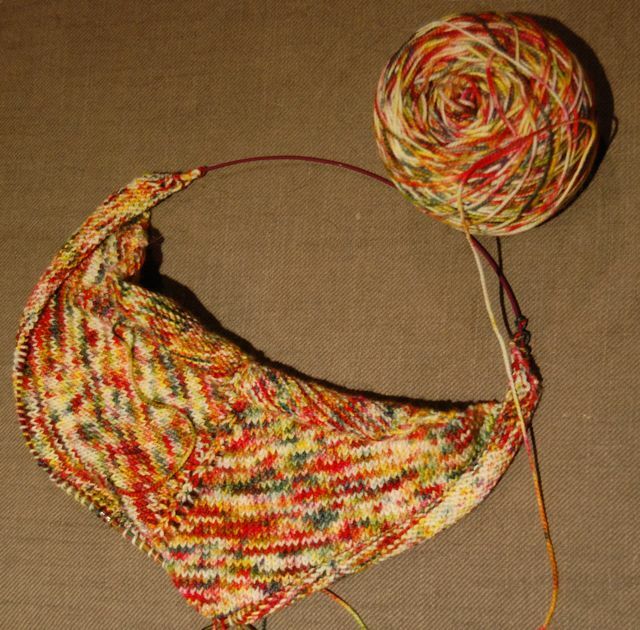 I think that I’m not that big on thinking about what I am knitting, much preferring to just knit. To say that I am a process knitter is a great big DUH!!! Anyway, put all this together and you have me trolling Ravelry for a pattern that I like for a little shawl or scarf that only uses one precious skein of sock yarn. And I found it. Even the name appealed to me for the mood I was in: Simple Things by Mary-Heather Cogar. I needed a really simple design for the amount of color in this skein of yarn and looking at the pictures of FO’s, I thought that this pattern could handle it. I am enjoying this pattern so much, don’t be surprised if everybody gets one of these for Christmas!